It’s fitting that this month’s MxMo should be about orange. 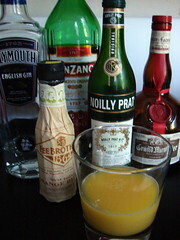 Some of the first mixed drinks I ever quaffed had orange juice as an ingredient. In fact, I’ll let you in on an embarrassing secret, one that will no doubt get me 86’d from any bar that any of you might happen to tend or haunt… one of those orangey drinks was <cough>fzynvl</cough>. What can I say?! I was 14! As an adult I traded up to the screwdriver, but it wasn’t long before that just seemed boring. I mean, voddy and OJ? Let me tell ya something, buddy–that crap’s just watered-down fruit juice. And now, unfortunately, although I love orange juice, I seldom mix with it. Mrs. Bitters is allergic, I’m afraid. She can have neither orange nor grapefruit. Luckily, other citrus is clear, and that’s a good thing because without lemon or lime at my disposal, I wouldn’t bother with this site. But that brings us to today’s MxMo, hosted by the zodiacal intoxicant herself, Gwen. The theme, orange. Now, what I wanted to do for this was make up a batch of homemade orange bitters. Unfortunately, the oranges I want to use, Seville oranges, aren’t in season apparently, and that tossed Plan A out the window. Plan B sounded like great fun–the Monkey Gland! Lucid is back on store shelves in the city and since I’ve never mixed with absinthe, I was excited to try that. But the weekend got away from us; the closest liquor stores with Lucid are either two subway lines away or two long bus trips away. So plan C. Life had handed me oranges and what’s there to do but twist Satan’s Whiskers. What a delightful name for a drink! The earliest mention of this drink is in the Savoy, but the measures are fiddly–two parts this and this, one part that and that and that. Doing the math required to craft a 3½-ounce cocktail seemed a pain, so I searched around and found Robert Hess’s recipe. I won’t reproduce it here (you can click the link for the proportions), but if you look to the right at my pic, you’ll see my ingredients. My judgment? A little sweet. It mellowed as it warmed up a bit, but I didn’t find it as satisfying as I’d hoped. Part of that may have been the orange juice. I could find only gnarly, shriveled oranges at the nearest produce stand, so I chose Tropicana Pure Premium, which is usually a very sweet juice. This cocktail deserves a tarter orange. I also wonder whether a bigger gin might have helped. OK, I’ll bite. What is “fzynvl”? That said, this is the third site, including mine, that talks of Screwdrivers for this MxMo that I’ve read so far. I almost wish I’d make it my feature now. Maybe by the time it all shakes out, someone who is wiser than us will go there! Can someone make an SD that we can get behind? Let’s face it, we’re all snobs in this little fraternity. Can one of us manage to take this most prosaic of drinks into a serious cocktail? Maybe it you replaced the Vodka and OJ with Gin, Lime Juice and Bitters? Nah. So tell us, what is “fzynvl”? and where can we get one? Yup, Jamie’s got it. Oh the shame! Oh, the Fuzzy Navel. I’ll see your admission and raise you this one: my mother used to be into wine coolers (Bartles & James, oh my) and I spent many a night around my 21st birthday drinking them with her. I like to use Tanqueray No. 10 when I mix it. I’ve never tried Plymouth in it, but your reaction doesn’t surprise me – I would expect Plymouth to be overwhelmed by the other ingredients. Yes, actual oranges work much better, but it is a somewhat sweet drink.